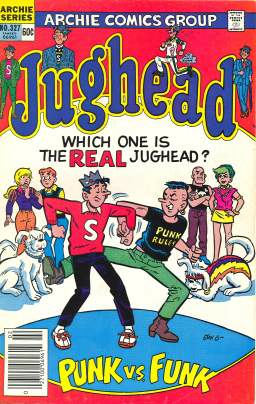 In the early 1980s, Jughead Jones became punk rock for a bit. 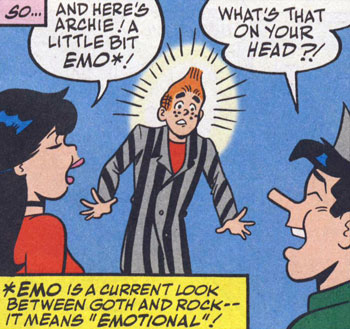 It doesn't surprise me one bit that the punk rock ethos helped him externalize some of his pent-up aggression toward his dull friend Archie. Are you KIDDING me? 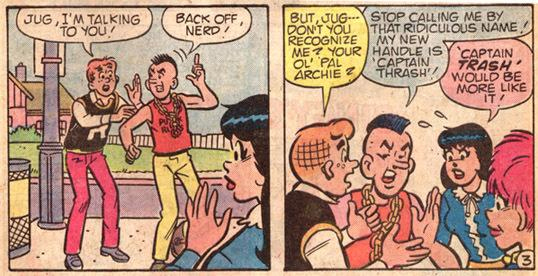 Congratulations on being the hugest closed-minded killjoy ever, Archie Andrews. 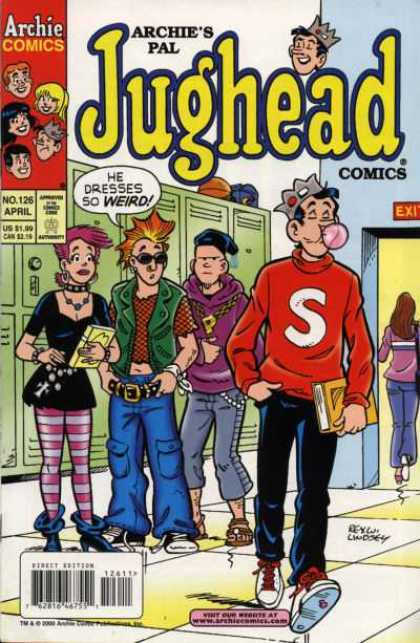 I never considered that Regular Jughead might be defined by "funk" culture; that seems like a stretch. I imagine Regular Jughead as being a Pavement fan. I think that, in this instance, Punk should win over Funk, if only because of how cute Hot Dog looks with his lightning stripes and sunglasses. Also: are the punk people standing behind Punk Hot Dog Reggie & Veronica? Midge & Moose, maybe? Or are they Punk Jughead's new punk friends, Henry Rollins and Ari Up? I think that Jughead looks crazy a lot like Combat Rock-era Joe Strummer in this picture. HOT!!!!!! It's so obvious that Jughead is a Clash fan. I bet his favorite Clash album is Sandinista. 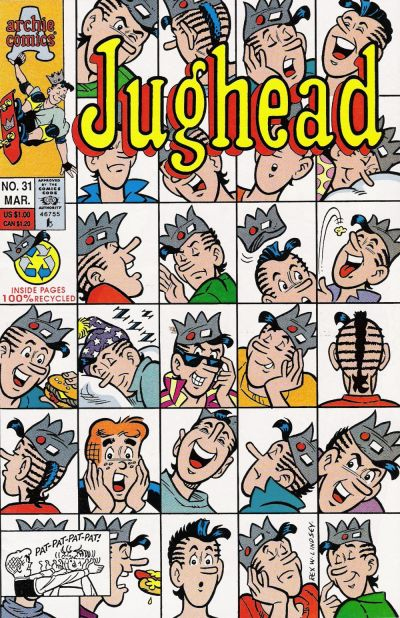 In the early 1990s, Jughead became a skate punk, and most likely listened to a ton of Check Your Head. Evidently, Archie couldn't handle it. Look at him! HE'S FREAKING OUT!!!!!!! 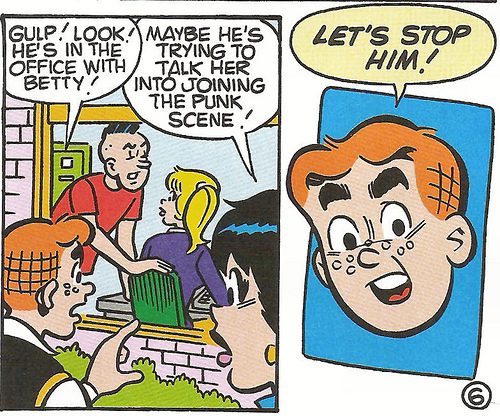 Here's what happens when Archie tries to be cool. Sad, huh? He looks like he's afraid of himself. So, were grey and black striped double-breasted jackets a "thing" about emo? I must have missed that one. 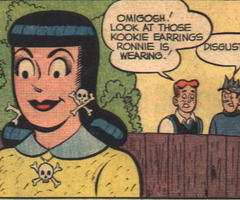 I like the way the Archie illustrator messed up Veronica's mouth in this drawing. She looks like Lisa Rinna. Psychobilly Veronica is a giant babe. Jughead's all Disgusting in the background, but it's only because he's chillaxed and Stephen Malkmus-y and doesn't get the point of trying so hard. Archie says "Omigosh!" and "Kookie." I hate him. Here is Jughead when Jughead was Syd Barrett. He is on his way to go drop acid with Space Oddity-era David Bowie and live the weekend that David Bowie wrote Memory of a Free Festival about. 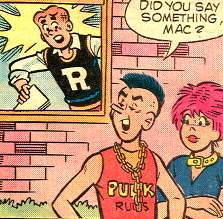 In the end, Jughead realizes that aligning oneself with a marginalized subculture can be just as oppressive as conforming to the status quo. The fully self-actualized Jughead Jones belongs only to himself. 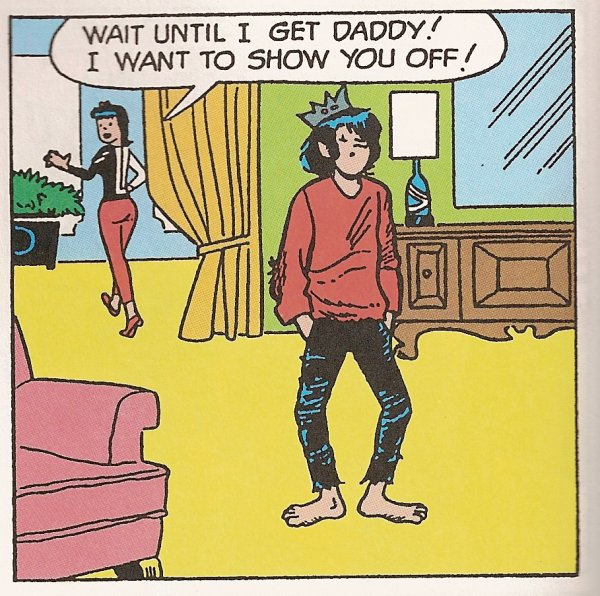 I am definitely coming around to Jughead.